Russia and the Islamic State pose the “greatest challenge” to national security in decades, the Foreign Secretary has warned. Speaking at the Royal United Services Institute (RUSI) on Tuesday morning, Philip Hammond said no one could “confidently and accurately” predict the causes of further security threats, but security agencies must have the capacity to effectively monitor causes for concern. “The sheer number and range of cases, old and new, amounts to the greatest challenge to our collective security for decades and places unprecedented demands on those charged with keeping us safe,” he said. His speech comes only two days before a backbench debate on defense spending in the Commons, where MPs will discuss the UK’s current commitment to NATO’s 2 percent of GDP spending target. The foreign secretary said Russia’s intensive modernization of its military capability was a “cause for concern,” likening the behavior to Cold War tactics. “We are in familiar territory for anyone over the age of about 50, with Russia’s behavior a stark reminder that it has the potential to pose the single greatest threat to our security,” he said. The foreign secretary emphasized the necessity of British security agencies to continue their clandestine role, implying that he was in favor of meeting the 2 percent NATO spending target. “We must respond decisively and positively to the public and parliamentary debate about the powers required by our intelligence agencies to do their job in a changed technological environment – and in doing so draw a line under that debate so that the agencies can get on with the job of keeping this country safe,” he said. 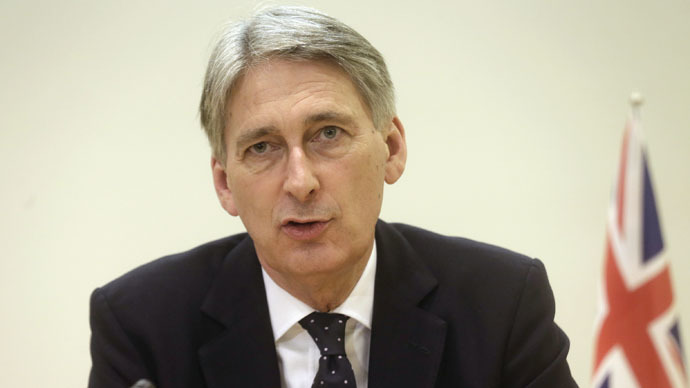 Hammond addressed the recent controversy surrounding human rights charity CAGE, which claimed that Jihadi John, identified as Mohammed Emwazi, had been radicalized by UK foreign policy, saying that “apologists” bear a “huge responsibility” for violence committed by extremists. MPs are expected later to approve new travel restrictions for those who pose a “terror-related threat,” which include stripping individuals of passports and introducing fines for airlines which breach the measures. In the run-up to the defense spending debate Thursday, which threatens to provoke a rebellion on the Tory benches, Liberal Democrat Deputy PM Nick Clegg has said the Conservatives must “come clean” on the military budget. There has been increasing pressure on the government from former NATO chiefs and senior defense officials to maintain the 2 percent of GDP NATO spending target.